NARS Under Cover 2016 Summer Collection is a stunner! It features products with beautiful shades and intense pigments - along with unique, illustrated packaging. 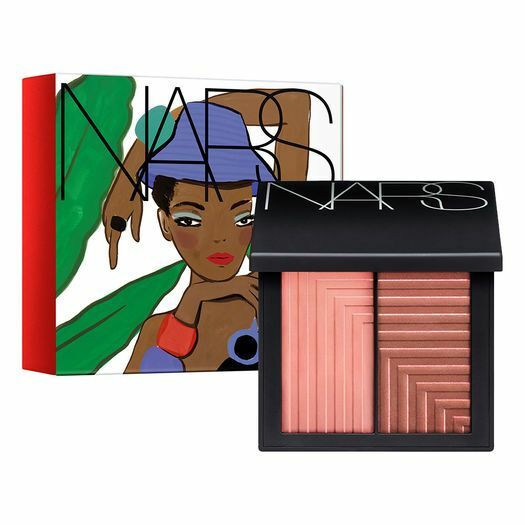 My favorite piece from the collection is the limited edition blush duo, NARS Dual-Intensity Blush, in Liberation (shown, above). The shade on the left is a shimmering pink and the right hand shade is a bronze-rose. I loved layering these shades, which work beautifully together..
Of course, if you want to use the lighter and darker shade them more as a contour/highlighter, they also work very well. The lighter pink shade on the left is a warm medium pink with a frosted finish. Since these blushes work both wet and dry, if you are interested in a more shimmery/metallic finish, I recommend applying them with a damp beauty blender. The formula is smooth and silky both wet or dry, and easily blendable and well as buildable. The warmness of both shades and the pretty finishes will work with a wide variety of skin tones, and especially when those who are naturally fair get tan this summer. The deeper bronze rose ion the right s also a warm shade, with a slight shimmer. If you want this shade to appear darker, you can apply it damp. The shade stayed true on my skin all day with no fading (and even longer when I applied it damp).